Excess fat under the chin bothers up to 67% of people. If you’re one of those people, MD Advanced Skincare offers you a proactive method of removing it. Kybella® treatments dissolve the fat and lift away your double chin, all the while feeling like a luxurious treat. Book a Kybella consultation at the Houston, Texas, practice online or over the phone. We often attribute double chins to weight gain or excess weight. However, weight gain is only one possible cause of the unpleasant “turkey” neck; genetics and aging also play a role. Years of gravity can pull on the submental (under-chin) fat, causing it to sag under the weight. Kybella is a form of mesotherapy, which is a technique using injections to dissolve subcutaneous fat. Kybella uses a prescription injection of deoxycholic acid to dissolve fat under the chin. 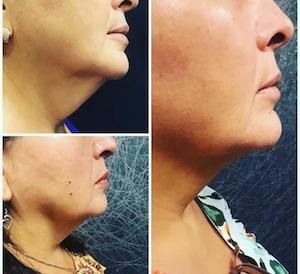 Kybella can reduce your double chin and thereby improve your profile. Deoxycholic acid is a metabolic byproduct that occurs naturally in the body. It helps the body break down and absorb dietary fat in the digestive system after we eat. In the same way, deoxycholic acid breaks down neck fat, and the body flushes it out of the system. First, your physician evaluates your chin and marks treatment guidelines under your chin. You or your doctor may choose to take a “before” picture at this point, so you can compare it to your “after” results later. Next, the physician cleans underneath the chin and proceeds with the injections. They make multiple shallow injections under the chin in a triangular pattern, staying clear of the jawbone. The injection process usually takes no longer than 15 to 20 minutes. Afterward, you might be left with some redness, swelling, and burning, but no side effects will leave you unable to perform your normal activities. Your doctor can provide ice packs and other pain intervention to help ease some of the discomfort. Most people undergo two or three treatments, spaced a month apart, to get the best results. People with denser submental fat may need up to six sessions. Since the procedure eliminates fat cells entirely, the results of Kybella are permanent. Those destroyed cells can’t regenerate, store, or accumulate fat anymore. When they’re gone, they’re gone for good. To schedule a consultation about Kybella treatments, call the Houston, Texas, medspa or use the online booking option.